Kidney Injury Molecule-1 (KIM-1): early diagnostic urinary marker - Advanced ImmunoChemical Inc.Advanced ImmunoChemical Inc. It is well known that kidney injuries can tend to accom­pany many severe illness­es such as cardiac diseas­es, trauma and sepsis, and is an increasingly common and devastating compli­cation in hospitalized pa­tients. Despite improve­ments in health outcomes in many areas during recent years, mortality and morbidity rates asso­ciated with acute kidney injury (AKI) remain very high. Currently, the diagnosis of AKI is predomi­nantly based on creatinine measurement in se­rum/plasma. However, creatinine levels start to in­crease late after the onset of disease, which leads to unavoidable delays in AKI diagnosis and makes treatment largely ineffective. Furthermore, cre­atinine concentration is considerably influenced by muscle mass and other factors that render its clini­cal use unreliable. Several new early biomarkers of AKI have been suggested recently and kidney in­jury molecule-1 (KIM-1) is among the most promis­ing ones. Click to see Assay Notes and product information. KIM-1 is expressed on the surface of tubular epi­thelial cells in the kidney. KIM-1 levels are unde­tectable in normal kidneys, whereas elevated KIM-1 expression was detected in the ischemic kidney in the animal model of disease, as well as in hu­mans. KIM-1 concentration in the urine of healthy humans is less than 1 ng/ml. Meanwhile, following the ischemic kidney injury it could be elevated up to 3-7 ng/ml. KIM-1 levels begin to increase as early as 6 hours after an ischemic insult and remain elevated for a period of 48 hours post-injury. KIM-1 is not only a sensitive diag­nostic marker but also has predictive value for AKI in patients undergoing cardiac surgery. 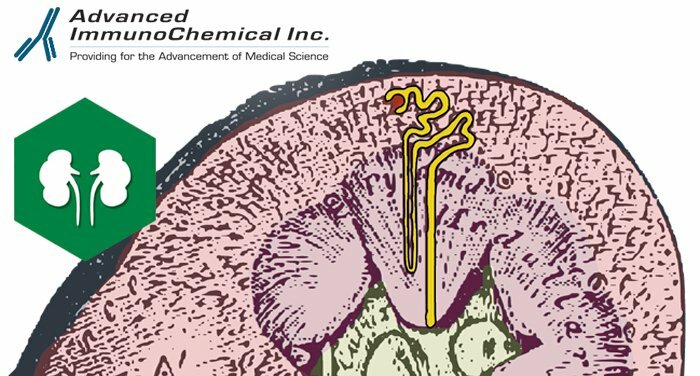 Kidney tissue may suffer from ischemia as a result of drug-related response. Accordingly, KIM-1 could be utilized as a nephrotoxicity biomarker in preclin­ical studies of drug candidates and the Food and Drug Administration has recently recognized KIM-1 as an appropriate biomarker for renal injury in preclinical studies of pharmacologic agents. According to some publications, KIM-1 could also be used for detecting certain types of cancer. Kidney injury molecule-1 is a transmembrane gly­coprotein (339 amino acid residues in length) with an N-terminal ectodomain (270 a.a.r.) that contains immunoglobulin-like and mucin domains. The ectodo­main of KIM-1 could be shed into urine upon isch­emic insult and could be detected with the help of specific antibodies. Due to its simplicity and high specificity, immunodetection of KIM-1 is the meth­od of choice for the clinical setting. Advanced ImmunoChemical offers two monoclonal antibod­ies specific to the ectodomain of human KIM-1 (cat.# 2-KIM1) and recombinant human KIM-1 antigen (cat.#8-KIMrh). Antibodies constitute a pair that is suitable for the measurement of KIM-1 levels in urine by sandwich ELISA.